About which book are these reviewers raving, you ask? 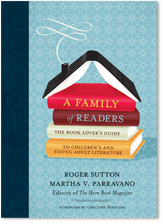 None other than FAMILY OF READERS, edited by Roger Sutton and Martha Pavarrano and published by Candlewick. 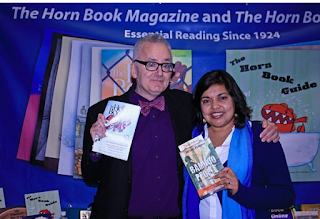 To find out more about this collection of Horn Book essays (including one of mine), curated thoughtfully and wisely by Roger and Martha, join us on Twitter Monday, 11/8, from noon-1 EDT. I'll be asking Roger questions, and you should feel free to chime in. Track the chat with hashtag #familyofreaders, and I'll also be posting the highlights on my blog. Roger Sutton and I, showing off our products.